Cruising through the mangrove maze in southwest Florida. I probably looked like a waterborne Shriner, minus the velvet fez and the bags full of candy, as I paddled out across the flat water of Buzzard’s Bay in the borrowed, lime-green kayak that was certainly way too small for my big-and-tall-department hind end. But beggars can’t be choosers, and on my last day in Matlacha, I was determined to catch something besides a gnarly sailcat—the slimiest, nastiest saltwater critter I’ve ever coaxed to a fly—from the seat of a kayak. 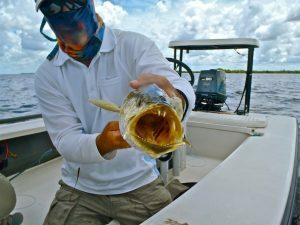 The day before, my friend Glenn Pittard motored me around the grass flats in his skiff just north Matlacha (pronounced “MAT-la-shay”) and Pine Island, and we caught foot-long speckled trout, seemingly at will, with a couple of larger specimens thrown in to keep things interesting. Toss in the occasional airborne lady fish, and we spent the morning giggling our way across the water before retiring for lunch and a beer at Bert’s. Knowing the fish were there for the taking—and having access to the kayak thanks to the folks putting me up at the Bridgewater Inn—I got up the next morning before dawn and was halfway across the bay by the time the sun hit the water. Mullet crashed the surface all around me, and a pair of ospreys made sure to scold me at every turn, but in less than an hour, I was battling “schoolie specks” and saucy lady fish on the fly. Bright red and yellow Clousers were the ticket, and once I found fish, the action was pretty silly. Glenn Pittard with a nice grass-flats speckled trout. I’ve taken to the saltwater kayak. You couldn’t get me into the whitewater version for all the nickels in the mall fountain, but I’ve found the open-top craft to be perfectly maneuverable on flat water and just my speed. 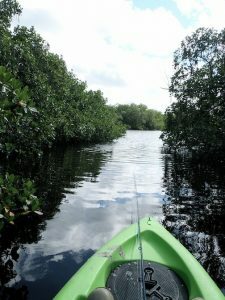 Two days earlier, I guided the same little craft deep into the mangrove creeks south of Matlacha, and while my success was limited to removing a Clouser from the maw of a beefy sailcat—and getting slimed in the process—I truly enjoyed what amounted to a backcountry angling experience amid the humanity of southwest Florida. I saw my first manatee—the creature scared the hell out of me when it surfaced just a few feet in front of me in the pre-dawn light, but once I knew what it was, I also knew just how fortunate I was to lay eyes on it. And, as a committed “do it yourself” junkie, I flailed around the mangroves until lunchtime with only the sailcat to show for my efforts—and while I was told I should be disappointed, the exact opposite was true. The damn thing tugged me all around the mangroves for a good 10 minutes before it finally let me dig around in its jaws for the beat-to-hell baitfish pattern. Saltwater fish—no matter their stripes—simply pull harder than the critters us Rocky Mountain backcountry trout fishers usually tangle with. A sailcat and a lime-green kayak… quite the combination. But after Glenn showed what was what on the grass flats, I was determined to put the new information to good use. And in just a few hours on my last day in Florida, I managed to bring to hand dozens of trout and a few lady fish, as well. Clousers, stripped fast over “potholes”—deeper depressions in the flats—worked with regularity, and while, for the most part, I was over-equipped with an 8-weight outfit, a couple of the specks put an appreciable bend in the rod. If it says anything about the experience, I’d do it again. In a minute. Matlacha and Pine Island are situated in southwest Florida, not far from Fort Myers. Pine Island is a funky little artist village, and the people who live there are about as far removed from “south Florida” as you can imagine. Life is pretty laid back in this barely discovered corner of the Sunshine State. Strangers smiled at me in the bars, and after a couple of days on their turf, I felt like a local. If a little thing called “summer” didn’t get in the way, I’d be perfectly happy paddling my days away on Buzzard’s Bay, chasing specks, redfish, snook and even tarpon. I’m looking forward to my next visit to this “old Forida” fishing haven. I just need to find a bigger kayak.